Placing these in the oven for 10 minutes transforms these from good sandwiches to GREAT sandwiches. All the flavors combine so nicely and the garlic and pepper give it just a little bite. These are definitely in my top 10 sandwiches ! Preheat oven to 350 degrees. Mid together garlic, oil, salt and pepper. Place ham, peppers and tomato on bun. Drizzle with garlic and oil mix and top with cheese. Wrap sandwich in foil and bake 10 minutes. 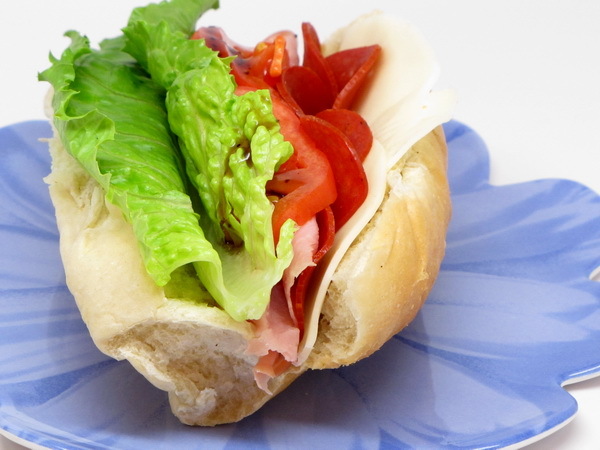 This is a hearty sandwich – lots of meat, a great cheese and a nice filling roll. If you pack it for lunch, just pack the dressing separate and drizzle on last second. Put all ingredients on roll and drizzle dressing over the top. 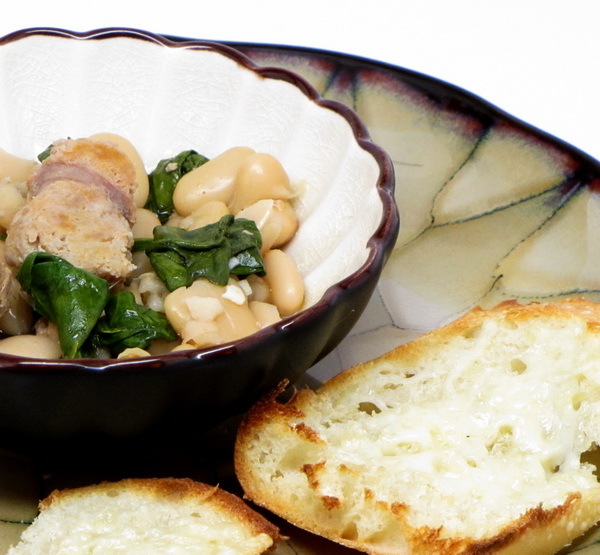 This is a great side and also a great quick appetizer. 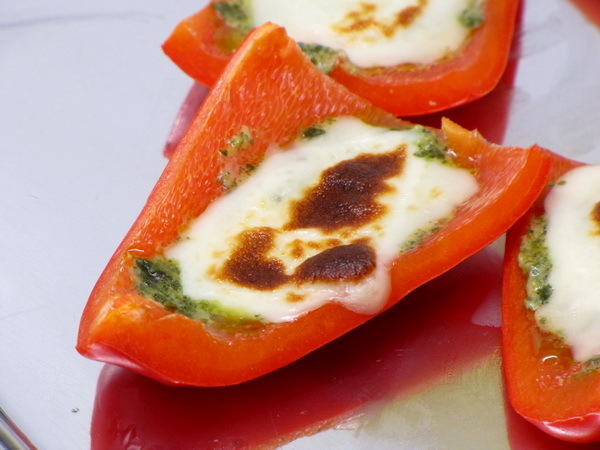 The melted cheese and pesto make such a nice accompaniment to the sweet red pepper. Quarter peppers and remove seeds. Brush outsides with oil. 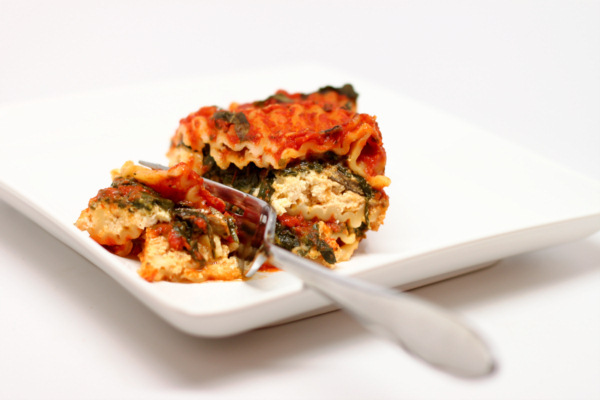 Fill insides with pesto and cheese. Heat grill. Grill peppers 5-7 minutes or until cheese is softened. 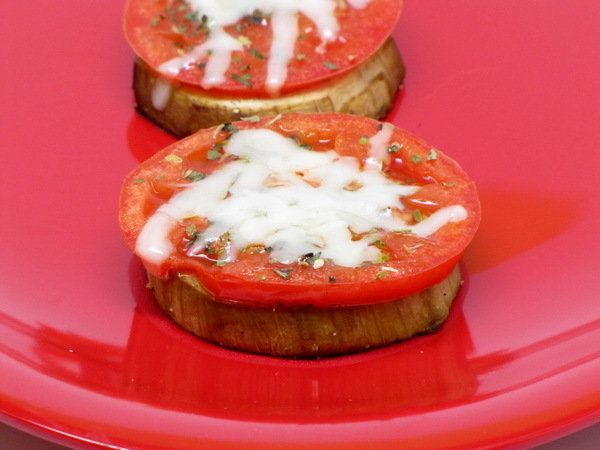 You can also broil these for a few minutes if you do not have a grill. 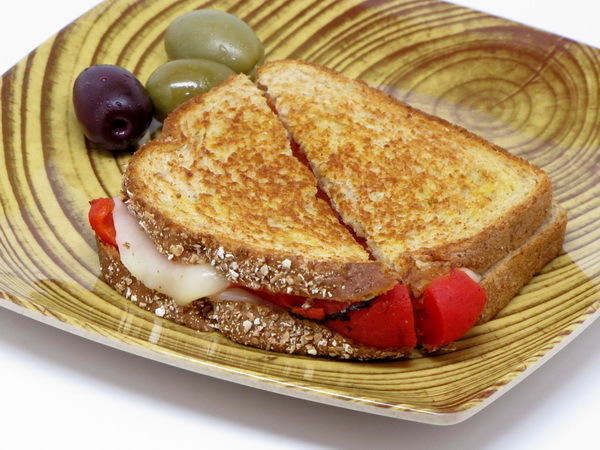 Any grilled cheese sandwich is a winner in my book and this one is no exception – and here the sweet roasted peppers are a nice contrast to the provolone. Make sandwiches and spray the outsides with the butter flavored spray. Heat a skillet to medium high and spray with Pam. Cook each side 2-3 minute or until browned and the cheese is all melted. 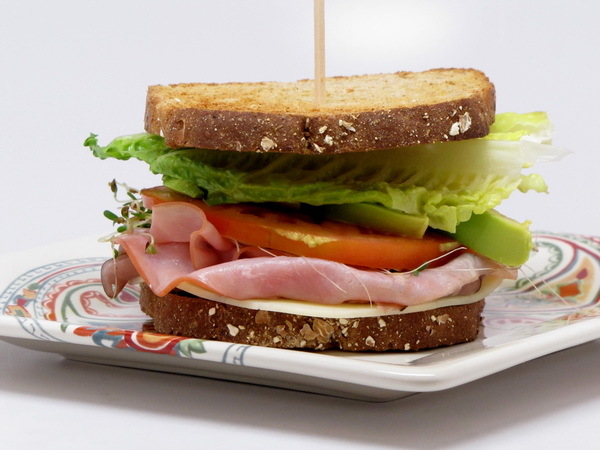 A big meaty, juicy, tasty sandwich just doesn’t seem like it can fit into a 400 calorie per meal diet – but it does ! And this one is sooooo tasty. Bacon, avocado, mayonnaise, dill, meat, cheese – you just can’t go wrong !! Combine mayo, dill, juice and pepper and spread over the toast. Add the sandwich meat, cheese, lettuce, tomato, sprouts and bacon and the top with the avocado slices. 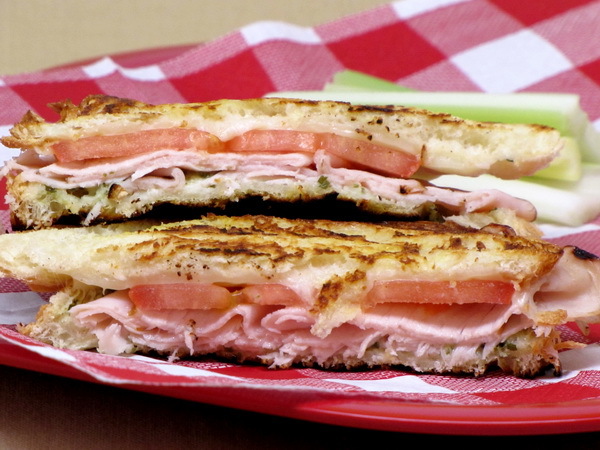 Turning a regular sandwich into a Panini makes it much more special – and all you are doing is grilling it up and pressing it a bit to melt down all the contents really well. A have a Panini pan that goes right on the stovetop – I also have a George Foreman type grill, but I like doing it stovetop better. Combine mayo and pesto and spread 1 T on each of 4 slices of bread. Top each slice with turkey, 1.2 oz. cheese, 2 tomato slices and the rest of the bread. Preheat grill pan and spray with Pam. 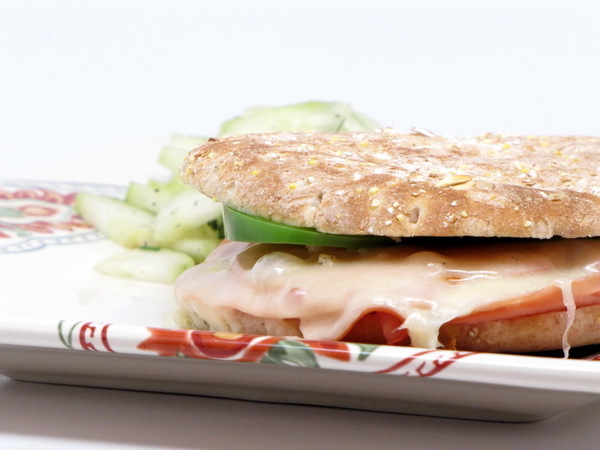 Spray each sandwich with a few spritzes of the ICBINB Spray and add sandwiches and cook 3 minutes per side.